It has been some time since I last wrote about Zecco. The reason is that I don’t use Zecco a lot these days as I used to in the past after it dropped the commission free trades last year, making it the same as any other discount brokers. But I still have an active account with Zecco and Zecco still has an edge, though now much smaller than before, over other brokers in terms of trading cost. At $4.50 per trade for online stock orders, it costs less to trade stocks and ETFs with Zecco (see how discount brokers compare against each other) than with other popular discount brokers such as TradeKing, Scottrade, and Firstrade. That’s why I still keep my account instead of closing it. Of course, those brokers have other offers for investors in order to compete with Zecco’s price advantage. One of the them is commission free ETF trades, which are currently available for Scottrade and Firstrade customers. So basically, what you will get is a $100 bonus from this promotion, but you do need to put at $10,000 in the new account in order to qualify for the bonus. Compared with what other brokers, particularly TradeKing which has done referral promotions quite frequently in the past, the requirement of new fund from Zecco is quite high in my opinion. But, as I said, the good thing about Zecco is that the trading cost is relatively low, so even if you take this opportunity to open an account with Zecco, it won’t cost more to trade with them as you do with other discount brokers. And since Zecco has already eliminated commission free trades, which has been the center of the pricing schedule adjustment it made in the past few years, I don’t expect any significant pricing change in the near term. If you are interested in opening a Zecco brokerage account and getting the $100 bonus, you can use the Contact form to email me to request a referral link. Before opening an account, learn more about Zecco pricing, trading platform, and research tools. i want to have some of the item. 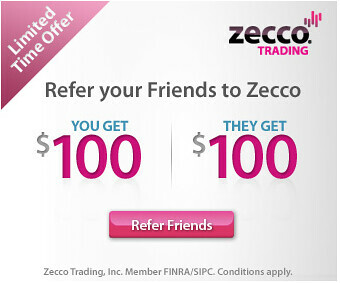 Hello,I am interested in your $20 deal and want to open zecco account to test it out, please send me a referral. Is the promotion still going on? If so, send me an invite. I’m gonna sign up soon. You want the referral?